Snow mobile safari 'Ramzai Pass' Short safari 3 - 4 hours. 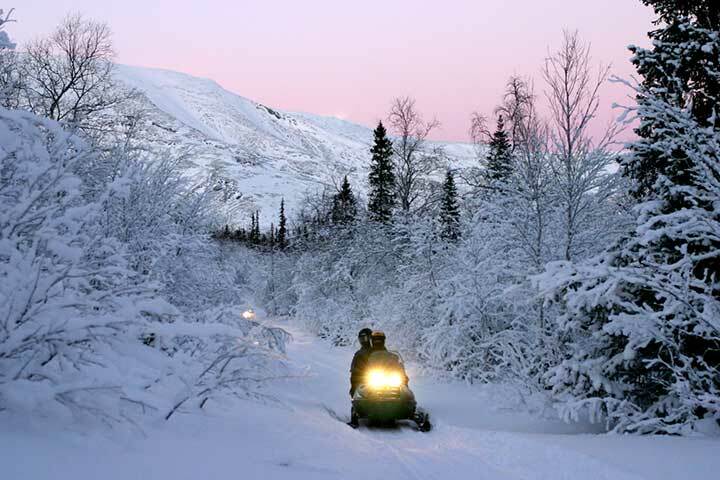 Snow mobile safari 'Ramzai Pass' Enjoy the winter wonder world of Kola Peninsula! Let yourself be surprised! 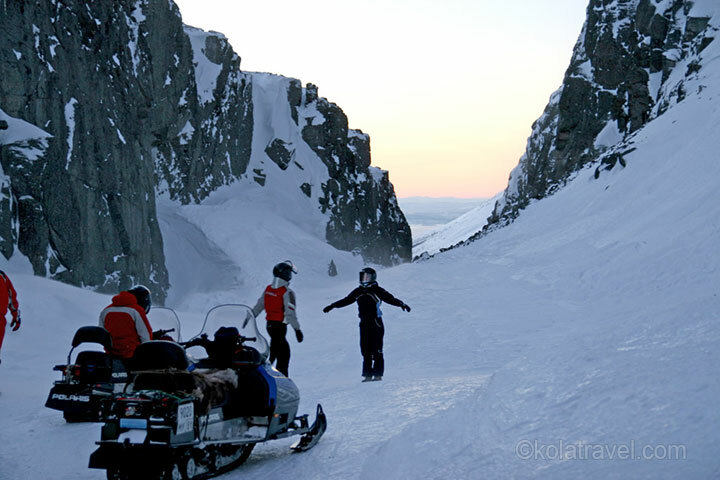 The rather difficult and unusual route goes over one of the main touristic tracks in Khibiny Tundra; the "Ramzai Pass". The Ramzai Pass is a beautiful pass, a deep rift with steep rocky walls and about 1 km long. From the pass, with beautiful views on the river valley "Malaya Belaya" and the biggest lake of the Kola named "Imandra". 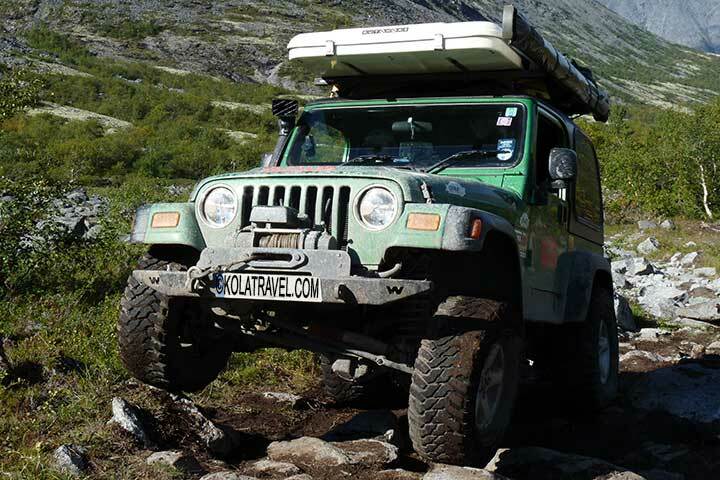 We drive back via the river valley to the highest part of Khibiny Tundra and make a stop at the West Petrelius Pass. 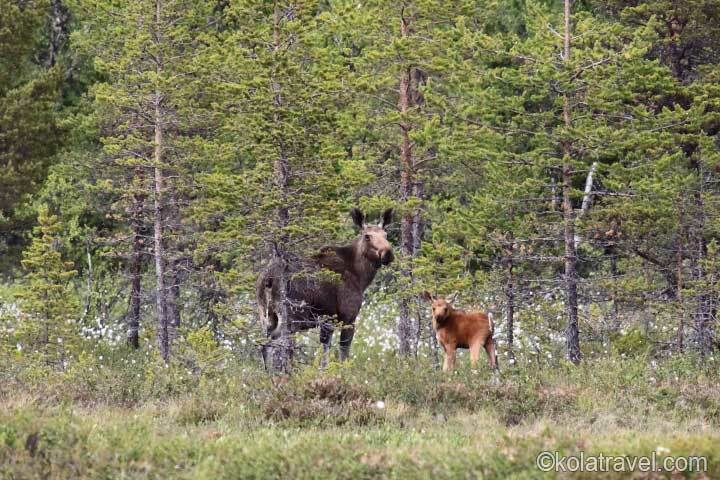 In the valley of "Malaya Belaya" there is change to meet foxes, hares and ptarmigans. The route length of 40 km. Remark: The tour program can be changed due to the weather conditions. 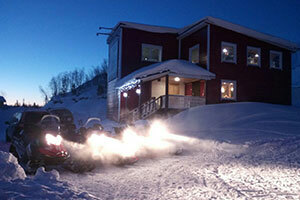 Meeting at our snowmobile safari centre close to Snow village near Kirovsk. Changing clothes. 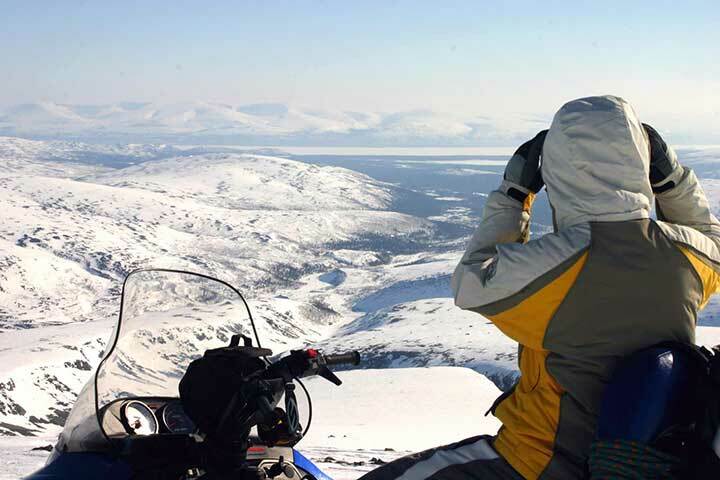 We provide you with a warm thermal overall, helmet, balaclava, warm boots and gloves. Your personal belongings what you don't need during the safari can be left safe in the safari centre. 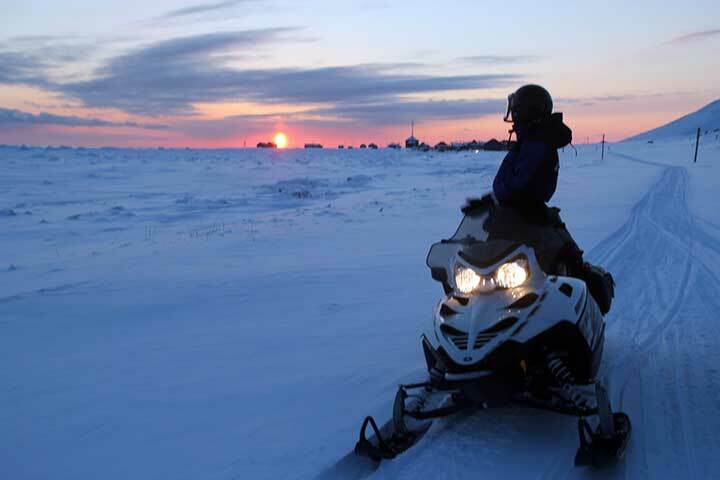 Snowmobile safari in Khibiny Tundra. Back to the safari centre. Changing clothes. Collecting you personal belongings. Leaving the safari centre with an great experience richer. Dates: Daily, but on request. Price: Prices are fixed, but on request. Please contact us. Dressing and instructions: Before driving, the participants select the necessary equipment - overalls, helmets, shoes etc. After that the participants goes outside and choose a snowmobile. The snowmobile guide/instructor explains the priciples about how to handle a snowmobile and let participants shortly speedup and brake. After dressing and instructions, which can take about 30-50 minutes (depending of group size), the snowmobile safari starts. 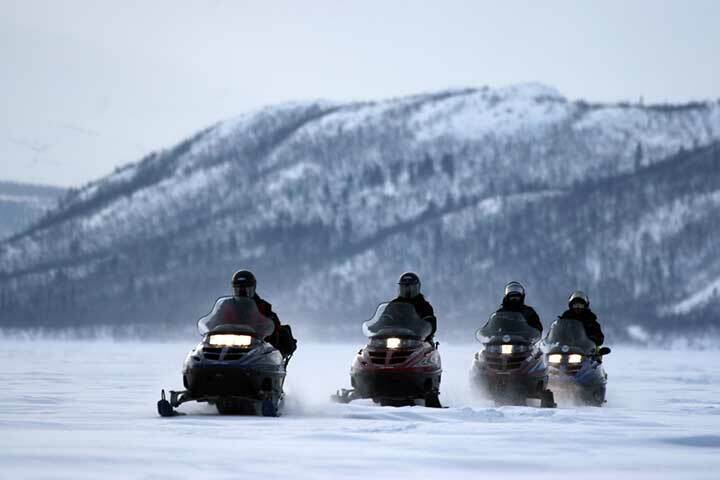 The participants drive in column formation behind the snowmobile guide/instructor and keep a distance between the snowmobile in front of minimal 15 meters. 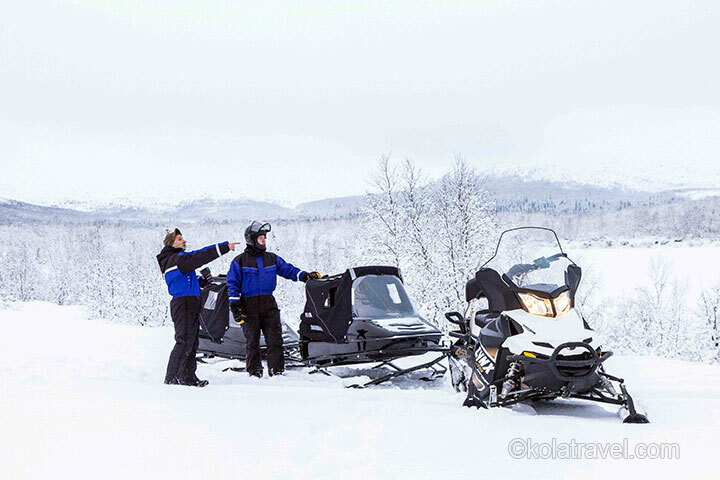 The snowmobile guide/instructor stops many times on interesting places so that you can make photographs. Driving under the influence of drugs and alcohol is prohibited. 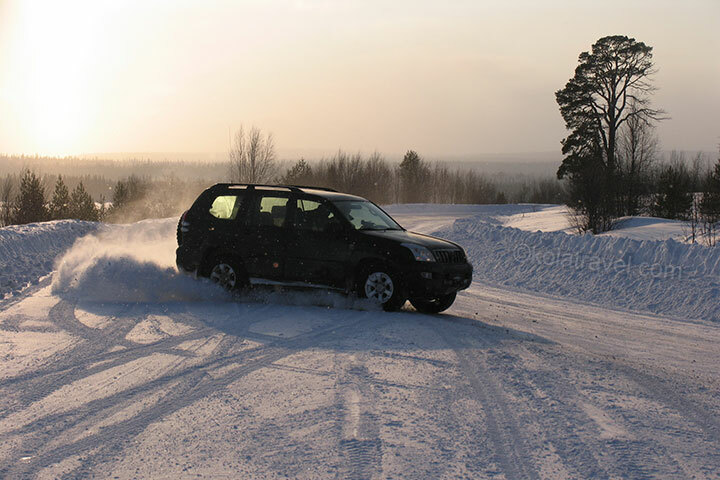 Overtaking other snowmobiles, driving off-track and not keeping distance between snowmobiles is not allowed. Driving a snowmobile without a helmet is prohibited. Chasing wildlife by snowmobile is expressly prohibited. 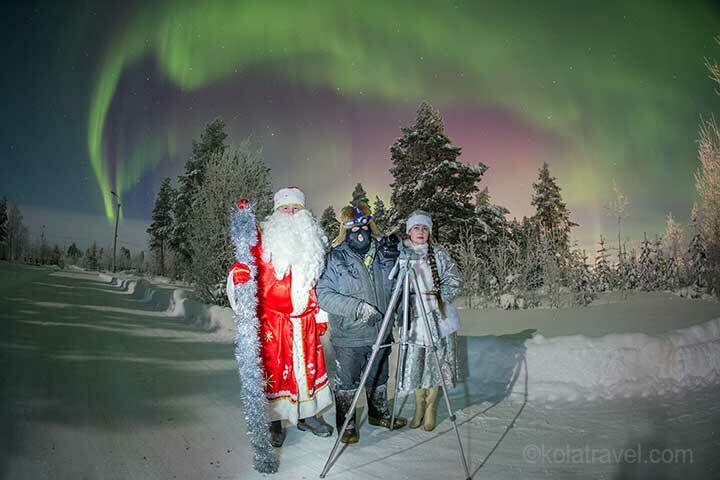 Celebrate this year Christmas / New Year in Saami village Krasnoschelye in the centre of Kola Peninsula. Meet the real Saami, their reindeers and habits. 5 days. 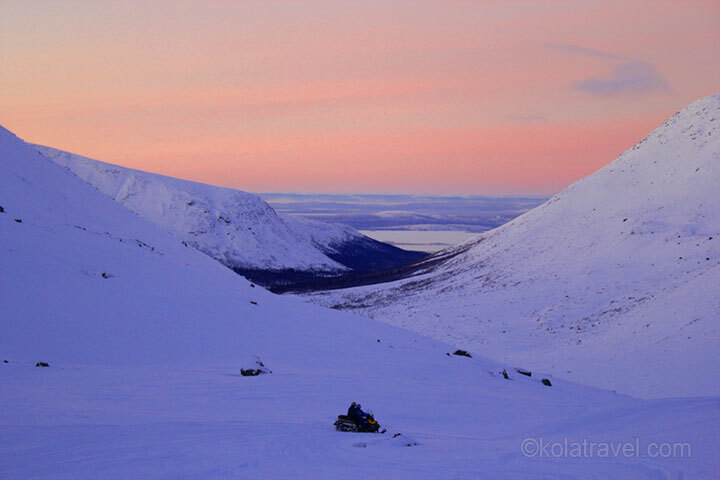 Travel by sledge pulled by snowmobile to the centre of Khibny Mountains during the Polar Night. Overnight in a mountain hotel. 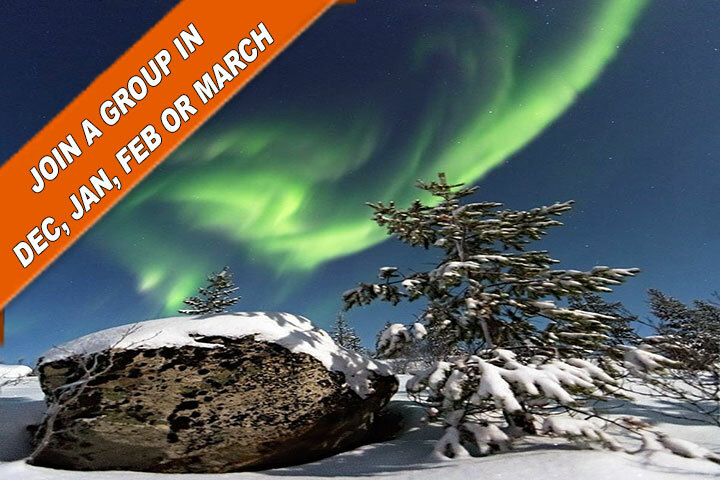 Enjoy snowshoe hiking, having picnic at a campfire and watching Aurora Borealis. 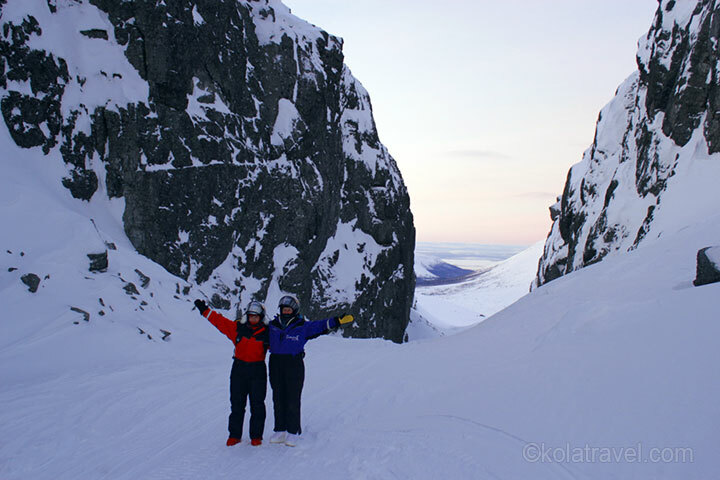 Exciting snowmobile tour in Khibny Mountains in the middle of Magic Polar Night. Overnight in a mountain hotel. 140 km in 2 days. 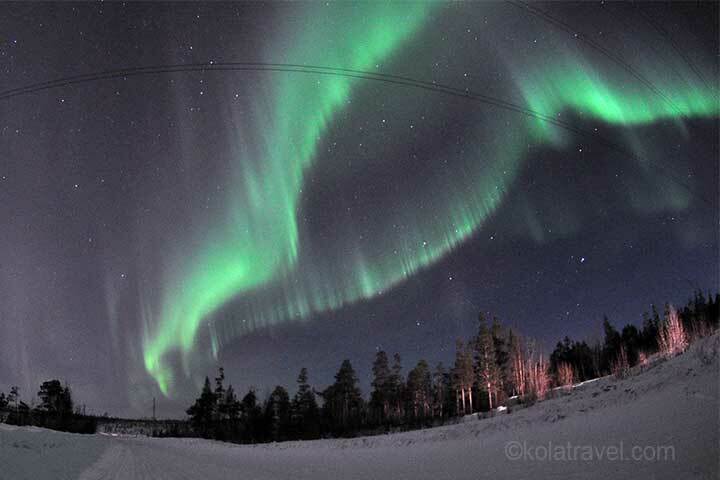 Keywords for this snowmobile safari are: snowmobiling (of course), meeting the Saami and reindeers, traditional Northern dishes, nature of Russian Lapland. 320 km in 3 days. 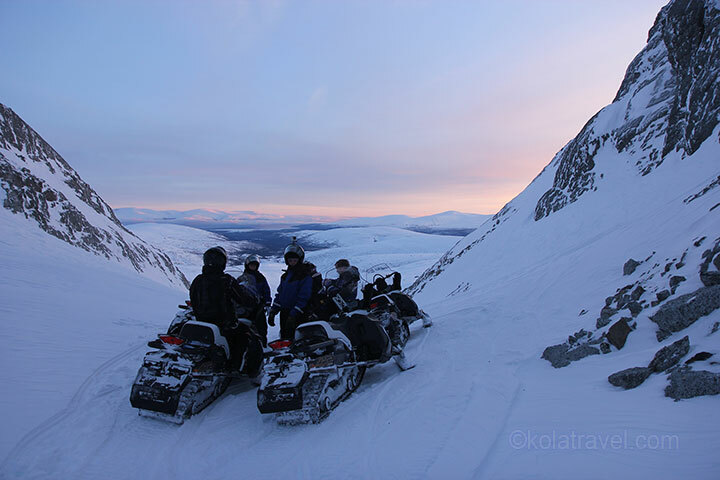 Expedition by snowmobile from Khibiny Tundra to the ice-covered White Sea on Kola Peninsula in Russian North. Visit ancient villages Varzuga and Kuzomen. Overnights in guesthouses in remote villages. 550 km in 6 days. 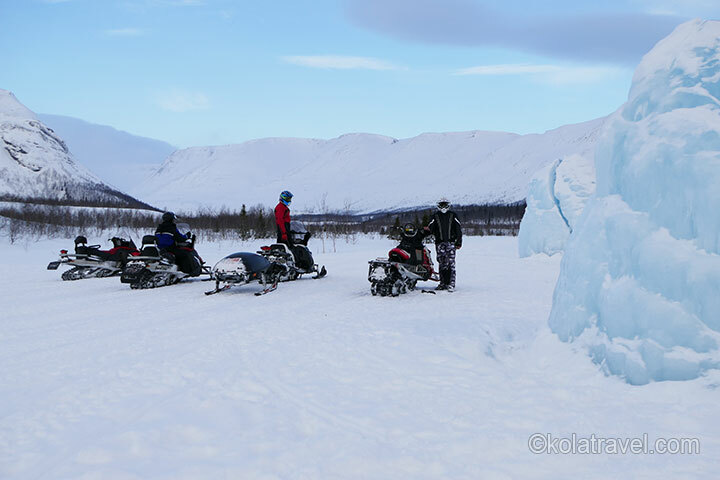 Our most extensive snowmobile expedition from Khibiny tundra to the southernmost point of Kola Peninsula. 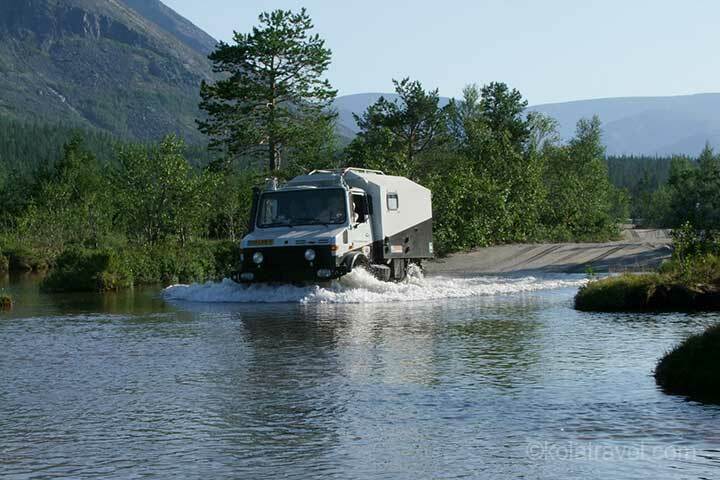 Visit villages Strelna, Chavanga and lighthouse Nikodimsky. Overnights in guesthouses. 800 km in 6 days.